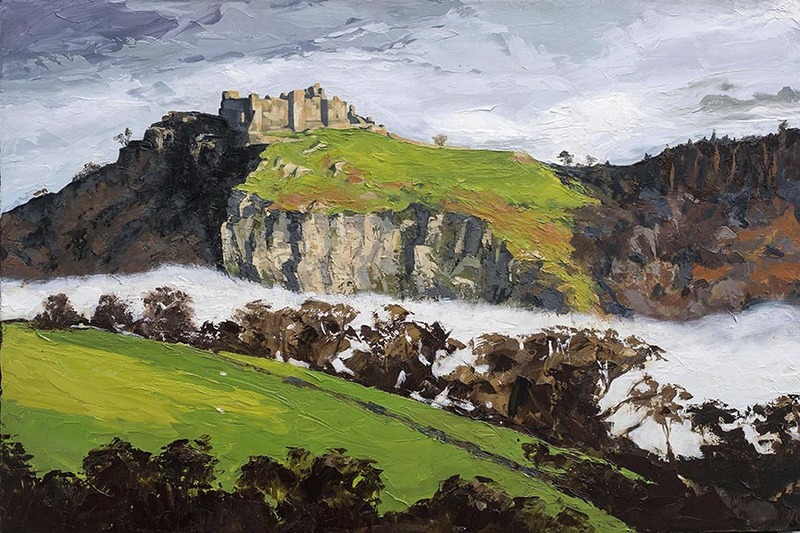 Carreg Cennen Castle sits high on a sheer limestone crag overlooking the remote Black Mountain (Mynydd Du) and the River Cennen in the western corner of the Brecon Beacons National Park, around four miles southeast of Llandeilo. The castle is within the Brecon Beacons National Park, and its location has been described as spectacular, due to its position above a limestone precipice. From my early teens, I would often visit the castle in the summer season with close friends and we enjoyed roaming around especially taking a trip down the dark underground tunnel to see the natural cave in the rock under the castle – a real adventure! This oil painting depicts a view of the castle from the south as it dramatically penetrates the early morning mist, drifting across the landscape to reveal the craggy mountainous terrain which it commands.